We breathe to help us take oxygen into the body and remove carbon dioxide. Our cells use the oxygen to break down food to release energy, and as they do so they produce carbon dioxide as a waste product. Cells release this carbon dioxide back into the bloodstream so that it can be transported to the lungs to be breathed out. Carbon dioxide also makes the blood more acidic; if the blood becomes too acidic, tissues and organs may not work properly. The brain uses roughly 25% of the oxygen consumed by the body and is particularly sensitive to the levels of gases and acidity in the blood. It has been known for more than a century that increased carbon dioxide causes blood vessels in the brain to widen, allowing the excess carbon dioxide to be carried away quickly. More recent work has shown that increased carbon dioxide also activates neurons called respiratory chemoreceptors. These in turn activate the brain centers that drive breathing, causing us to breathe more rapidly to help us remove surplus carbon dioxide. But this scenario contains a paradox. If high levels of carbon dioxide cause widening of the blood vessels in the brain regions that contain respiratory chemoreceptors, this should, in theory, wash out that important stimulus, reducing the drive to breathe. So how does the brain prevent this unhelpful response? By studying the brains of adult rats, Hawkins et al. show that different rules apply to the brain centers that control breathing compared to other areas of the brain. In one such region, if the blood becomes too acidic, support cells called astrocytes release chemical signals called purines. This counteracts the tendency of high carbon dioxide levels to widen blood vessels in this region, and instead causes these vessels to become narrower. This mechanism ensures that local levels of carbon dioxide in respiratory brain centers remain in tune with the demands of local networks, thereby maintaining the drive to breathe. The next challenges are to identify the molecular mechanisms that control the diameter of blood vessels in brain regions containing respiratory chemoreceptors, and to find out whether drugs that modulate these mechanisms have the potential to treat some respiratory conditions. Cerebral blood flow is highly sensitive to changes in CO2/H+. An increase in CO2/H+ causes vasodilation and increased blood flow, which in turn facilitates removal of excess CO2/H+. This response, known as vascular CO2 reactivity, serves to match blood flow with tissue metabolic needs (Ainslie and Duffin, 2009). Maintaining tight control of brain CO2/H+ levels is critical, as there is only a narrow range that is conducive to normal neural function. For example, a modest alkalosis of just 0.2 pH units can trigger seizure activity; conversely, a similar degree of acidification can inhibit cortical activity (Schuchmann et al., 2006). Tissue CO2/H+ levels are also regulated by respiratory activity. This is accomplished by specialized subsets of neurons known as respiratory chemoreceptors that are activated by an increase in CO2/H+ (Guyenet and Bayliss, 2015). This information is then relayed to respiratory centers to enhance breathing, and consequently facilitate removal of arterial CO2 in the exhaled breath. The retrotrapezoid nucleus (RTN) is a region critical for respiratory chemoreception (Guyenet and Bayliss, 2015). This region contains a subset of neurons that are intrinsically sensitive to changes in CO2/H+ (Mulkey et al., 2004: Wang et al., 2013) and relay responses to further respiratory control regions, such as the ventral respiratory complex to control breathing rate, inspiratory amplitude, active expiration and airway patency (Guyenet and Bayliss, 2015; Silva et al., 2016). Disrupting mechanisms by which RTN neurons sense CO2/H+ abolishes ventilatory responses to CO2 and results in severe apnea (Kumar et al., 2015). Interestingly, RTN astrocytes also support chemoreception by providing a CO2/H+-dependent purinergic drive that enhances activity of chemosensitive neurons (Gourine et al., 2010; Wenker et al., 2012). This function of RTN astrocytes is unique to the RTN since astrocytes elsewhere do not respond similarly to changes in pH (Gourine et al., 2010; Sobrinho et al., 2014). For more than a century, vascular CO2 reactivity has been assumed to be a common feature of the entire cerebrovascular tree (Ainslie and Duffin, 2009; Roy and Sherrington, 1890). However, if CO2/H+-induced vasodilation were to occur in chemosensitive regions it would accelerate removal of tissue CO2/H+ and effectively counter-regulate activity of respiratory chemoreceptors (Xie et al., 2006). Therefore, we propose that regulation of vascular tone is specialized to support local neural network function, and specifically that a chemoreceptor region like the RTN has evolved a means of maintaining vascular tone during exposure to high CO2/H+ in a manner that supports the drive to breathe. Consistent with this, early studies showed that fast breath by breath changes in arteriole CO2 correspond with changes in pH measured at the ventral medullary surface (Millhorn et al., 1984), suggesting tissue pH in this region is not highly buffered, possibly because blood vessels in this region do not dilate in response to CO2/H+. Furthermore, considering that CO2/H+-evoked ATP release appears to be unique feature of RTN chemoreception (Gourine et al., 2010) and since ATP can mediate vasoconstriction in other brain regions (Kur and Newman, 2014; Peppiatt et al., 2006), we hypothesize that CO2/H+-evoked ATP release will antagonize CO2/H+-vasodilation in the RTN, and thus prevent CO2/H+ washout, further enhancing chemoreceptor function. Consistent with this hypothesis, we find that arterioles in the RTN and cortex are differentially modulated by purinergic signaling during exposure to high CO2/H+. Specifically, we show in vitro and in vivo that exposure to CO2/H+ caused vasoconstriction of RTN arterioles but vasodilation of cortical arterioles. The CO2/H+-response of RTN arterioles was blocked by bath application of a P2 receptor blocker (pyridoxalphosphate-6-azophenyl-2',4'-disulfonic acid; PPADS) and mimicked by a P2Y2/4 receptor agonist (UTPγS) but not a P2X receptor agonist (α,β-mATP), suggesting mechanism(s) underlying this response in the RTN involve purinergic signaling and downstream activation of P2Y2 and/or P2Y4 receptors. To support the possibility that RTN vascular control contributes to respiratory behavior, we show that disruption of purinergic regulation of vascular tone or application of a vasodilator (SNP) to the RTN region decreased the ventilatory response to CO2, whereas application of vasoconstrictors (phenylephrine or U46619) potentiated the central chemoreflex. These results suggest for the first time that regulation of vascular tone in a respiratory chemoreceptor region is specialized to support the drive to breathe. We initially tested our hypothesis using the brain slice preparation optimized for detecting increases or decreases in vascular tone (see Mateials and methods). For these experiments, we targeted arterioles based on previously described criteria (Mishra et al., 2014; Filosa et al., 2004). Vessel diameter was monitored continuously during exposure to 15% CO2 (pH = 6.9) under baseline conditions and during purinergic receptor blockade with PPADS. Consistent with our hypothesis, we found CO2/H+ differentially regulates arteriole diameter in the RTN depending on the function of purinergic receptors. For example, exposure to CO2/H+ under control conditions resulted in a vasoconstriction of −4.6 ± 0.6% (p<0.0001, N = 34 vessels) (Figure 1C) (estimated by Poiseuille’s law to decrease blood flow by ~20%). Further, we found that CO2/H+-induced constriction of RTN arterioles was retained in the presence of tetrodotoxin (TTX; 0.5 µM) to block neuronal action potentials (−6.1 ± 1.6%, p=0.0103, N = 6 vessels), thus suggesting glutamatergic CO2/H+-activated neurons (Mulkey et al., 2004) are not requisite determinants of this response. Conversely, exposure to CO2/H+ did not cause constriction of RTN arterioles during P2 receptor blockade with 5 µM PPADS (−0.1 ± 0.9%, p=0.4876, N = 8 vessels) (Figure 1A–C). We also tested effects of exogenous ATP to confirm that it functions as vasoconstrictor of RTN arterioles. Indeed, we found that exposure to ATP (100 µM) resulted in a −5.8 ± 1.5% constriction (p=0.0018, N = 7 vessels) (Figure 1D–E). 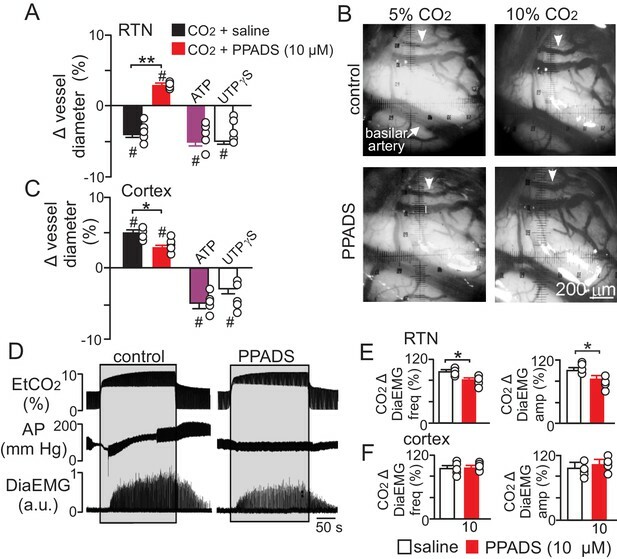 These results show that purinergic signaling contributes to CO2/H+-dependent control of RTN arterioles. CO2/H+-induced vasoconstriction of RTN arterioles is mediated by a purinergic dependent mechanism involving P2Y2/4 receptors. (A) trace of an RTN arteriole diameter show that increasing CO2 in the perfusion media from 5% to 15% (balance air, in TTX) caused vasoconstriction under baseline conditions but not in PPADS (5 µM). (B) example vessel image under baseline conditions and corresponding fluorescent intensity profile plots also show that exposure to high CO2 decreased vessel diameter. Profile plot scale bars: 2000 a.u., 10 µm. (C) summarized results of RTN arteriole responses to CO2/H+ under baseline conditions (N = 34 vessels) and when P2-receptors were blocked (5 µM PPADS; N = 8 vessels), P1-receptors were blocked (10 µM 8-PT; N = 7 vessels), or ectonucleotidase activity was inhibited (100 µM POM1; N = 5 vessels). (D) example diameter traces show RTN arterioles constrict in response to bath application of ATP (100 µM) or the selective P2Y2/4 receptor agonist UTPγS (0.5 µM) but dilate when P1 receptors are activated by adenosine (Ado; 1 µM). (E) summary data plotted as % diameter change in response to ATP (N = 7 vessels), UTP (N = 8 vessels), α,β-mATP (100 µM, preferential P2X agonist; N = 9 vessels) or adenosine (N = 9 vessels). (F–G), immunoreactivity for P2Y2 (F) and P2Y4 (G) receptors was detected as brightly label puncta near endothelial cells (DyLight 594 Isolectin B4 conjugate; IB4), arteriole smooth muscle (α-smooth muscle actin; αSMA), and astrocytes (glial fibrillary acidic protein; GFAP) associated with arterioles in the RTN (N = 3 animals). Arrows identify receptor labeling close to endothelial or smooth muscle cells and arrowhead identifies receptor labeling of astrocyte processes. Scale bar 10 µM. Hash marks designate a difference in µm from baseline as determined by RM-one-way ANOVA and Fishers LSD test or paired t-test and asterisks identify differences in CO2/H+-induced % change under baseline conditions vs in the presence of PPADS (C) or ATP vs specific agonist-induced % change (E) (one-way ANOVA and Fishers LSD test); one symbol = p<0.05, two symbols = p<0.01, three symbols = p<0.001, four symbols = p<0.0001. Purinergic receptors are expressed by a wide variety of cell types including neurons, astrocytes, smooth muscle and endothelial cells; in the context of vascular control, the P2 receptors most commonly implicated in vasoconstriction are several members of the P2X family of ionotropic receptors and metabotropic P2Y2, P2Y4 and P2Y6 (Burnstock and Ralevic, 2014). Since the concentration of PPADS used above to block purinergic modulation of RTN arterioles has highest affinities for P2X and P2Y2 and P2Y4 (Ralevic and Burnstock, 1998), to identify candidate P2 receptors that help maintain RTN arteriole tone during exposure to CO2/H+, we tested effects of a selective P2Y2 and P2Y4 receptor agonist (UTPγS) (Lazarowski et al., 1996) and an agonist with high affinity for P2X receptors (α,β-mATP) (Burnstock and Kennedy, 1985). We found that bath application of UTPγS (0.5 µM) mimicked effects of CO2/H+ by decreasing diameter of RTN arterioles (−3.4 ± 0.6%, p=0.0003, N = 8 vessels), whereas exposure to α,β-mATP (100 µM) minimally affected arteriole tone (p=0.2113, N = 9 vessels) (Figure 1D–E). These results suggest that mechanism(s) underlying purinergic-dependent control of RTN arterioles during high CO2/H+ involve activation of Gq-coupled P2Y2/4 receptors. To further support this possibility, we performed immunohistochemistry using commercially available P2Y2 and P2Y4 specific antibodies in conjunction with cell-type specific markers for endothelial cells (DyLight 594 Isolectin B4 conjugate; IB4), vascular smooth muscle cells (α-smooth muscle actin; α-SMA), and astrocytes (anti-glial fibrillary acidic protein; GFAP). We detected P2Y2 and P2Y4 immunoreactivity in close proximity to all three cell types associated with RTN arterioles. For example, P2Y2 and P2Y4 labeling appeared as numerous intensely stained puncta near endothelial cells and smooth muscle cells and as smaller more diffuse puncta near astrocytes (Figure 1F–G). The expression of these receptors together with our functional evidence suggest P2Y2/4 receptors contribute to purinergic-dependent vasoconstriction in the RTN during exposure to CO2/H+. Considering that ATP and UTP breakdown products are known to affect vascular tone in other brain regions (Burnstock and Ralevic, 2014), we also pharmacologically manipulated P1 receptors and ectonucleotidase activity before or during exposure to CO2/H+. We found that application of adenosine (1 µM) under control conditions caused vasodilation of RTN arterioles (2.6 ± 0.6%; p=0.0027, N = 9 vessels) (Figure 1D–E); however, blockade of adenosine receptors with 8-phenyltheophylline (8-PT; 10 µM) had negligible effects on CO2/H+-induced vasoconstriction (−3.2 ± 0.4%, p=0.0002, N = 7 vessels) (Figure 1C). Likewise, incubation in sodium metatungstate (POM 1; 100 µM) to inhibit ectonucleotidase activity also minimally affected the CO2/H+-vascular response of RTN arterioles (−3.1 ± 0.6%, p=0.0195, N = 5 vessels) (Figure 1C). These results suggest that nucleoside metabolites are not essential for CO2/H+-dependent regulation of vascular tone in the RTN. Previous evidence (Gourine et al., 2010) suggests CO2/H+-evoked ATP release from RTN astrocytes is mediated by intracellular Ca2+. Therefore, in the absence of high CO2, pharmacological activation of RTN astrocytes should trigger arteriole constriction by a purinergic-dependent mechanism. We test this by bath application of t-ACPD (50 µM), an mGluR agonist used to elicit Ca2+ elevations in cortical astrocytes (Filosa et al., 2004; Zonta et al., 2003). Exposure to t-ACPD caused vasoconstriction of RTN arterioles under baseline conditions (−3.5 ± 0.5%, p=0.0007, N = 7) but not in PPADS (−0.6 ± 0.4%, p=0.2163, N = 7 vessels) (Figure 2A–B,E). These results are consistent with our hypothesis that purinergic signaling, possibly from CO2/H+-sensitive RTN astrocytes (Gourine et al., 2010), serves to maintain tone of arteriole in the RTN during hypercapnia. t-ACPD-mediated astrocyte activation has opposite effects on arteriole diameter in the RTN and cortex. 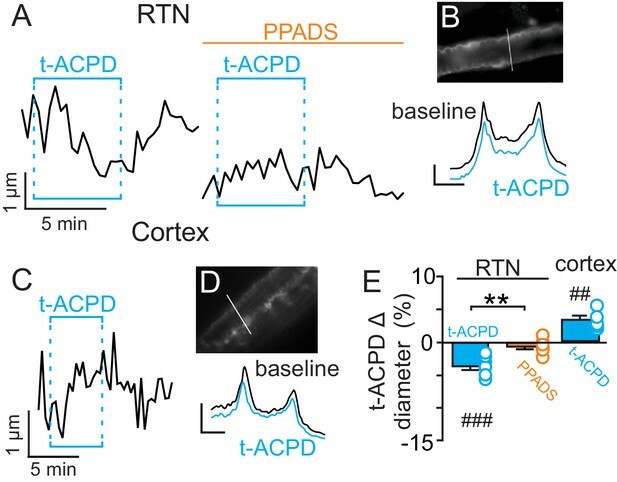 (A) diameter trace of an RTN arteriole show the response of an RTN arteriole to t-ACPD (50 µM) under baseline conditions and during P2-receptor blockade with PPADS (5 µM). (B) example RTN vessel image under baseline conditions and corresponding fluorescent intensity profile plots also show that exposure to tACPD decreased vessel diameter. (C) diameter trace of an cortical arteriole and corresponding vessel image with example profile plots (D) show that exposure to tACPD (50 µM) increase cortical arteriole diameter. Profile plot scale bars: 2000 a.u., 10 µm. (E) summary from the RTN (N = 7 vessels) and cortex (N = 5 vessels) data show that t-ACPD caused vasoconstriction of RTN arterioles under control conditions but not in the presence of PPADS, suggesting purinergic signaling most likely from astrocytes mediate constriction of arterioles in the RTN. Conversely, in the cortex t-ACPD caused vasodilation. ##, difference in µm from baseline (paired t-test, p<0.01). ###, difference in µm from baseline (RM-one-way ANOVA and Fishers LSD test, p<0.001). **, difference in t-ACPD-induced % change under baseline conditions vs in PPADS (paired t-test, p<0.01). In marked contrast to the RTN, we found that cortical arterioles dilated in response to astrocyte activation by t-ACPD. For example, bath application of t-ACPD (50 µM) dilated cortical arterioles by 3.2 ± 0.6% (p=0.0030, N = 5 vessels) (Figure 2C–E). This response is consistent with previous cortical studies (Filosa et al., 2004; Zonta et al., 2003), and suggests that astrocytes in the RTN and cortex have fundamentally different roles in regulation of vascular tone. Also consistent with previous work (Ainslie and Duffin, 2009), we confirmed that cortical arterioles dilate in response to CO2/H+(5.7 ± 1.1%, p=0.0057, N = 11 vessels) (Figure 3A–C). Interestingly, we also found that the CO2/H+-vascular response of cortical arterioles was reduced to 0.5 ± 0.5% in PPADS (p=0.004, N = 6 vessels) (Figure 3A–C), suggesting involvement of endogenous ATP in cortical arteriole CO2/H+-dilation. As in the RTN, we also found that endothelial cells, smooth muscle and astrocytes associated with cortical arterioles were immunoreactive for P2Y2 and P2Y4 (Figure 3D–E), suggesting the differential roles of purinergic signaling in these regions is not due to the presence or absence of P2Y2 and P2Y4. However, since the vascular responses to activation of P2Y2/4 can vary depending on which cells express the receptor (Burnstock and Ralevic, 2014), it remains possible that differential expression of P2Y2/4 by endothelial and smooth muscle may mediate vasodilation in the cortex and constriction in the RTN, respectively. It is also possible that other purinergic receptors contribute to regulation of arteriole tone in these regions. For example, endothelial P2Y1 receptors are known to mediate vasodilation in the cortex (Burnstock and Ralevic, 2014). However, we found that in vivo application of a selective P2Y1 receptor blocker (MRS2179, 100 µM) had no measurable effect on the CO2/H+ response of pial vessels in the RTN (−3.7 ± 0.8%, vs. saline plus CO2: −4.3 ± 0.7%; p=0.068; N = 5 vessels) or cortex (4.8 ± 0.5%, vs. saline plus CO2: 4.7 ± 0.6%; p=0.24; N = 5 vessels) (data not shown). Alternatively, arachidonic acid metabolites are also potent regulators of vascular tone (MacVicar and Newman, 2015) and recent evidence showed that CO2/H+-mediated vasodilation in the cortex and hippocampus involved activation of cyclooxygenase-1 and prostaglandin E2 release by astrocytes (Howarth et al., 2017). Considering that purinergic signaling can elicit Ca2+ responses in astrocytes to facilitate prostaglandin E2 synthesis (Xu et al., 2003), it remains possible that purinergic signaling contributes to cortical CO2/H+ dilation by influencing synthesis and release of prostaglandin E2 by astrocytes. However, currently the cellular and molecular basis of purinergic dilation in the cortex remains unknown. Cortical arterioles dilate in response to CO2/H+. (A) diameter trace of a cortical arteriole with an example vessel image and fluorescence profile plots (B) show that exposure to CO2/H+ caused vasodilation under baseline conditions and this response was blunted by PPADS (5 µM). Profile plot scale bars: 2000 a.u., 10 µm. (C) summary data show CO2/H+-induced vasodilation of cortical arterioles under bassline conditions (N = 11 vessels) but not in PPADS (N = 6 vessels). (D–E), immunoreactivity for P2Y2 (D) and P2Y4 (E) receptors was detected as brightly label puncta near endothelial cells (DyLight 594 Isolectin B4 conjugate; IB4), arteriole smooth muscle (α-smooth muscle actin; αSMA), and astrocytes (glial fibrillary acidic protein; GFAP) associated with cortical arterioles (N = 3 animals). Arrows identify receptor labeling close to endothelial or smooth muscle cells and arrowheads identifies receptor labeling of astrocyte processes. Scale bar 10 µM. ##, difference in µm from baseline (paired t test, p<0.01). **, difference in CO2/H+-induced % change under control conditions vs in PPADS (paired t-test, p<0.01). To determine whether regulation of vascular tone in the RTN impacts respiratory behavior, we pharmacologically manipulated RTN vessels in anesthetized rats while simultaneously measuring systemic blood pressure and diaphragm EMG activity (as a measure of respiratory activity) during exposure to high CO2. We found that localized application of the vasoconstrictors phenylephrine (Phe; 1 µM) or U46619 (1 µM) to the ventral medullary surface (VMS) enhanced the ventilatory response to CO2 by increasing diaphragm electromyogram (EMG) amplitude 15 ± 2% and 18 ± 1.8%, respectively (Figure 4A–C) (p=0.02; N = 6 animals) but with no change in frequency (Figure 4D) (p>0.05; N = 6 animals). Also consistent with the possibility that increased blood flow will facilitate removal of tissue CO2/H+, and thus decrease the stimulus to chemosensitive neurons, we found that VMS application of the vasodilator sodium nitroprusside (SNP; 1 µM) decreased ventilatory response to CO2 by decreasing diaphragm amplitude by 24 ± 2.6% (Figure 4A–C) (p=0.02; N = 6 animals) but with no change in frequency (Figure 4D) (p>0.05; N = 6 animals). These treatments had negligible effect on systemic mean arterial pressure (MAP) (Phe: 110 ± 2; SNP: 110 ± 2; U4619: 108 ± 3 vs. saline: 109 ± 2 mmHg; p>0.05) (Figure 4E). These results are consistent with the possibility that regulation of vascular tone in the RTN can influence respiratory output. However, we cannot exclude potential direct effects of these drugs on activity of neurons or astrocytes in the region. For example, phenylephrine can directly stimulate activity of chemosensitive RTN neurons (Kuo et al., 2016). Therefore, effects of phenylephrine on chemoreception likely involves both vasoconstriction and direct neural activation. It remains to be determined whether U46619 or SNP also affect activity of neurons or astrocytes in the RTN. Local constriction and dilation of RTN vessels reciprocally modulates the ventilatory response to CO2in vivo. (A) end expiratory CO2 (EtCO2), arterial pressure (AP) and diaphragm EMG (DiaEMG) traces show that application of vasoconstrictors (phenylephrine, Phe, 1 µM or U46619, 1 µM) or a vasodilator (sodium nitroprusside, SNP, 1 µM) to the RTN increased and decreased the ventilatory response to 7–8% CO2, respectively. (B) diaphragm EMG (DiaEMG) traces expanded in time show that application of Phe, U46619 or SNP, to the VMS in the region of the RTN increased and decreased the DiaEMG amplitude response to 7–8% CO2. (C–E) summary data show effects of saline, SNP, Phe and U46619 applications to the VMS near the RTN on DiaEMG amplitude (N = 6 animals per group) (C), DiaEMG frequency (D) and mean arterial pressure (MAP) (E). *, difference in CO2/H+-induced % change under control conditions (saline) vs during vasodilation or vasoconstriction (RM-ANOVA followed by Bonferroni multiple-comparison test, p<0.05). To determine whether purinergic signaling regulates CO2/H+-mediated constriction in vivo, we first measured the diameter of pial vessels on the VMS in the region of the RTN or on the surface of the cortex during exposure to high CO2 under control conditions and when P2 receptor are blocked with PPADS (10 µM). Consistent with our in vitro data, we found that increasing end-expiratory CO2 to 9.5–10%, which corresponds with an arterial pH of 7.2 pH units (Guyenet et al., 2005), constricted VMS vessels by −4.5 ± 0.5% (p=0.014, N = 5 animals) (Figure 5A–B). However, when P2-receptors are blocked with PPADS (10 µM), increasing inspired CO2 resulted in a vasodilation of 4.3 ± 0.4% (Figure 5A–B) (p=0.036; N = 5 animals). This suggests that in the RTN, purinergic-mediated vasoconstriction is working against a background CO2/H+ dilation, possibly mediated by a cyclooxygenenase/prostroglandine E2-dependent mechanism as described elsewhere in the brain (Howarth et al., 2017). Therefore, disruption of CO2/H+ dilation would be expected to enhance purinergic-dependent vasoconstriction of RTN arterioles, and thus increase baseline breathing and the ventilatory response to CO2. Consistent with this, administration of a cyclooxygenase inhibitor (indomethacin) has been shown to increase baseline breathing and the ventilatory response to CO2 in humans (Xie et al., 2006). However, it is also possible that decreasing cerebral blood flow globally by indomethacin treatment or cerebral ischemia (Chapman et al., 1979) will cause widespread acidification leading to enhanced activation of multiple chemoreceptor regions including those outside the RTN (Nattie and Li, 2012), thus further increasing chemoreceptor drive. It should also be noted that global disruption of cerebrovascular CO2/H+ reactivity as associated with certain pathological states including heart failure and stroke (Yonas et al., 1993; Howard et al., 2001) or by systemic administration of indomethacin can increase chemoreceptor gain to the extent that breathing becomes unstable (Fan et al., 2010; Xie et al., 2009). These results underscore the need to understand how CO2/H+ regulates vascular tone at other levels of the respiratory circuit. 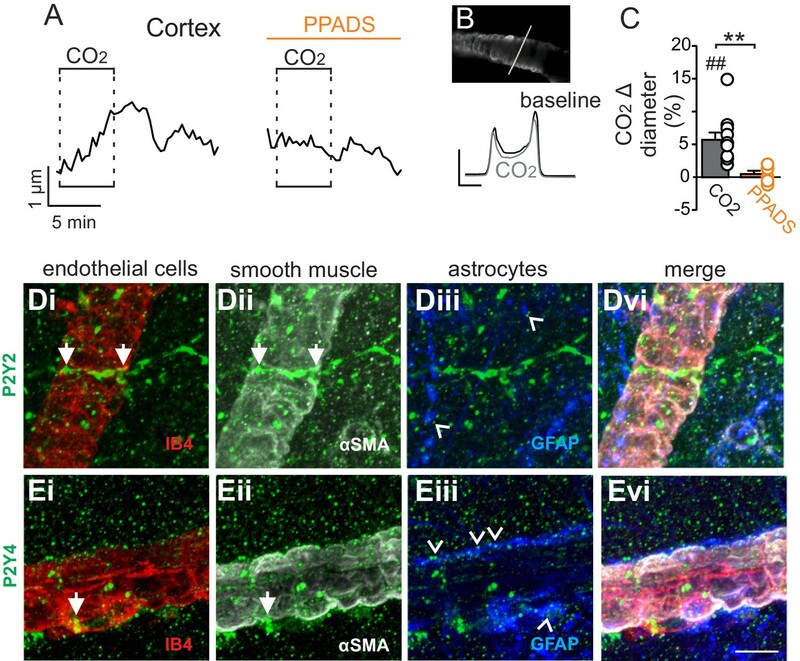 Purinergic signaling opposes CO2/H+-dilation of VMS pial vessels in vivo and contributes to the ventilatory response to CO2. (A) summary data plotted as % change in RTN pial vessel diameter in response to an increase in end expiratory CO2 after VMS application of saline (100 nL; N = 5 animals) or PPADS (10 µM, 100 nL; N = 5 animals). Also shown are the vascular responses to VMS application of ATP (1 mM, 100 nL; N = 5) and UTPγS (1 mM, 100 nL; N = 5 animals). (B) Photomicrographs (40X) show pial vessel distribution on the VMS, arrow; representative vessel analyzed. (C) Summary data shows the response of cortical pial vessels to CO2 after local application of saline or PPADS (10 µM, 100 nL; N = 5 animals). Also shown are vascular responses to exogenous application of ATP (1 mM - 100 nL; N = 5 animals) or UTPγS (1 mM, 100 nL; N = 5). (D) End expiratory CO2 (EtCO2), arterial pressure (AP) and diaphragm EMG (DiaEMG) traces show that bilateral VMS application of PPADS (10 µM, 100 nL) attenuated the ventilatory response to CO2. (E) summary data show CO2-induced changes in DiaEMG frequency and amplitude after bilateral VMS application of saline and PPADS (10 µM; N = 5 animals). (F) summary data show that PPADS (10 µM) application to the cortex surface had no measurable effect on CO2-induced changes in DiaEMG frequency and amplitude (N = 5 animals). Hash marks designate a difference in µm from baseline (RM-ANOVA followed by Bonferroni multiple-comparison test, #, p<0.05). Asterisks identify a difference in CO2/H+--induced % change under control conditions (saline) vs in the presence of PPADS (RM-ANOVA followed by Bonferroni multiple-comparison test, *, p<0.05; **, p<0.01) (panels A and C) or paired t-test (panel E, *, p<0.05). Also consistent with our slice data, we found that exogenous application of ATP (1 mM) or UTPγS (1 mM) constricted VMS vessels by −5.1 ± 0.6% and −5.0 ± 0.5%, respectively (p=0.001; N = 5 animals) (Figure 5A). Conversely, cortical pial vessels dilated in response to an increase in inspired CO2 under control conditions (5 ± 0.5%) and after application of 10 µM PPADS (3.2 ± 0.3%) (Figure 5C) (p=0.03; N = 5 animals); however, the CO2/H+-induced vasodilation of cortical vessels was blunted in the presence of PPADS (p=0.03; N = 5 animals), suggesting endogenous purinergic signaling may facilitate dilation of cortical vessels in response to CO2/H+. However, we failed to mimic this response by exogenous application of purinergic agonists; exposure to ATP (1 mM) or UTPγS (1 mM) constricted cortical vessels by −4.9 ± 0.7% and −4.1 ± 0.7%, respectively (p=0.024; N = 5 animals). These divergent results are not entirely unexpected since we detected P2Y2 and P2Y4 immunoreactivity on endothelial cells and smooth muscle of cortical arterioles (Figure 3D–E), and exogenous application of P2 agonists may activate P2 receptors not necessarily targeted by endogenous purinergic signaling. Future work is required to identify the source of purinergic drive and effector P2 receptors contributing to vascular CO2/H+-reactivity in the cortex. In addition, as previously described (Gourine et al., 2005), we found that application of PPADS (10 µM) to the RTN blunted the ventilatory response to CO2 both in terms of DiaEMG frequency (82 ± 3, vs. saline: 97 ± 4%) (p=0.042, N = 5) and amplitude (83 ± 6, vs. saline: 100 ± 5%) (p=0.035, N = 5) (Figure 5D–E). Considering that RTN manipulations of vascular tone preferentially affect respiratory amplitude (Figure 4A–D), whereas application of PPADS to the same region, which likely disrupts both direct excitatory effects of ATP on RTN chemoreceptors (Wenker et al., 2012) and indirect effects of ATP on vascular tone (Figure 5A), blunts respiratory frequency and amplitude, suggests that purinergic signaling in the RTN might regulate discrete aspects of respiratory output. In the cortex, application of PPADS had no measurable effect on CO2-induced changes in DiaEMG frequency (p=0.33, N = 5 animals) and amplitude (p=0.42, N = 5) (Figure 5F). Together with previous evidence, these findings suggest that purinergic signaling contributes to RTN chemoreception by directly activating RTN neurons (Gourine et al., 2010) and indirectly by opposing CO2/H+-vasodilation. It should be acknowledged that our study is limited to the use of pharmacological tools that potentially have off-target effects. We have minimized this concern by (i) using low concentrations of PPADS that are reported to be specific for P2 receptor’s (Lorier et al., 2004); (ii) mimicking CO2/H+-induced vasoconstriction in vitro and in vivo by exogenous application of ATP and a specific P2Y2/4 receptor agonist (UTPγS), but not by a non-specific P2X receptor agonist (α,β-mATP); (iii) confirming that candidate P2Y2 and P2Y4 receptors are expressed in the RTN at the astrocyte-arteriole interface; and (iv) for in vitro experiments by confirming that CO2/H+-induced vasoconstriction was retained when neuronal action potentials were blocked with TTX. Therefore, our results suggest that purinergic signaling possibly through P2Y2/4 receptors in the RTN provides specialized control of vascular tone by preventing CO2/H+-induced dilation. Our results also suggest that regulation of vascular tone in the RTN contributes functionally to the ventilatory response to CO2. This is the first evidence to suggest that regulation of vascular tone in a chemoreceptor region contributes to the drive to breathe. This discovery may be of fundamental importance to understanding how regulation of vascular tone impacts neural network function and ultimately behavior. All procedures were performed in accordance with National Institutes of Health and University of Connecticut Animal Care and Use Guidelines. A total of 93 adult Sprague Dawley rats (60–100 days of age) were used for in vitro experiments. Animals were decapitated under isoflurane anesthesia, and transverse brainstem slices (200 μm) were prepared using a vibratome in ice-cold substituted artificial cerebrospinal fluid (aCSF) solution containing (in mm): 130 NaCl, 3 KCl, 2 MgCl2, 2 CaCl2, 1.25 NaH2PO4, 26 NaHCO3, and 10 glucose, with 0.4 mM L-ascorbic acid added (all Sigma-Aldrich). Slices were incubated for ∼30 min at 37°C and subsequently at room temperature in aCSF. Prior to imaging slices were incubated for 1 hr with 10 µg/ml TRITC-lectin conjugate (Sigma-Aldrich, St. Louis, MO) or 6 µg/ml DyLight 594 Isolectin B4 conjugate (Vector Labortories) to label endothelial cells as previously described (Mishra et al., 2014). Slicing solutions were equilibrated with a high oxygen carbogen gas (95% O2-5% CO2) (Mulkey et al., 2001). An individual slice containing the RTN was transferred to a recording chamber mounted on a fixed-stage microscope (Zeiss Axioskop FS) and perfused continuously (∼2 ml min−1) with aCSF bubbled with 5% CO2, 21% O2 (balance N2; pHo ~7.35; 37⁰ C) (Gordon et al., 2008). Hypercapnic solution was made by equilibrating aCSF with 15% CO2, 21% O2 (balance N2; pHo ~6.90; 37⁰ C). Arterioles were identified as previously described (Mishra et al., 2014; Filosa et al., 2004) by the following criteria: clear evidence of vasomotion under IR-DIC, bulky fluorescent labeling and a thick layer of smooth muscle surrounding the vessel lumen. Vessels that appeared collapsed and unhealthy were excluded, as were those with little fluorescence staining and thin walls, indicative of a lack of smooth muscle (Mishra et al., 2014). All arterioles selected for analysis had a resting luminal diameter of between 8–45 µm; RTN vessels were located within 200 µm of the ventral surface and below the caudal end of the facial motor nucleus and cortical vessels were located in layers 1–3. For an experiment, fluorescent images were acquired at a rate of 1 frame/20 s using a x40 water objective, a Clara CCD Andor camera and NIS Elements software. To induce a partially constricted state we bath applied a thromboxane A2 receptor agonist (U46619; 125 nM; Sigma-Aldrich, St. Louis, MO). At this concentration, U46619 has been shown to decrease vessel diameter by 20–30% under similar experimental conditions, thus allowing assessment of both vasodilation and vasoconstriction (Filosa et al., 2004; Girouard et al., 2010). In the continued presence of U-46619, we then characterized the effects of hypercapnia, ATP (100 µM; Sigma-Aldrich, St. Louis, MO), α,β-methyleneATP (100 µM), UTPγS (0.5 µM), and adenosine (1 µM), or the mGluR agonist t-ACPD ((±)−1-aminocyclopentane-trans-1,3-dicarboxylic acid; 50 µM) alone or in the presence of P2-recepetor blocker PPADS (5 µM; Tocris Bioscience, Minneapolis, MN), the P1 receptor antagonist 8-Phenyltheophylline (8-PT; 10 µM; Sigma) or the Ecto-NTPDase antagonist sodium metatungstate (POM 1; 100 µM; Tocris). In a subset of experiments we also tested CO2, ATP and PPADS in the presence of TTX (0.5 µM; Alomone Laboratories). As previously described (Girouard et al., 2010), at the end of each experiment we assessed arteriole viability by inducing a constriction with a high K+ solution (60 mM) and then maximal dilation with a Ca2+ free solution containing EGTA (5 mM), papaverine (200 μM, a phosphodiesterase inhibitor) and diltiazem (50 µM, to block L-type Ca channels). Vessels from both regions of interest (RTN and cortex) show similar responses to these conditions, and vessels that did not respond were excluded from analysis. Rat brain slices were prepared from three rats and labelled with DyLight 594 Isolectin B4 conjugate as above followed by immersion fixation overnight in 1% paraformaldehyde in pH 7.4 PBS at 4°C. Excess fixative was removed by three washes in PBS, and prior to antibody incubations, tissue sections were treated to unmask epitopes with 0.2 mg/ml pepsin (Sigma-Aldrich, St. Louis, MO) in 0.2 M HCl for 10 mins at 37°C (Corteen et al., 2011) followed by three washes in PBS for P2Y4 labelling only. A blocking stage was then performed by incubating tissue in 10% normal horse serum in PBS with 10% Triton X-100 (Sigma-Aldrich, St. Louis, MO) for 1 hr at room temperature (RT). Sections were then incubated overnight at RT with primary antibodies diluted in blocking solution as follows: 1:200 rabbit anti-P2Y2 (RRID: AB_2040078) or P2Y4 receptor (RRID: AB_2040080) (Alomone Labs, Alomone Labs, Jerusalem Israel), 1:200 chicken anti-glial fibrillary acidic protein (RRID: AB_177521) (Chemicon) and 1:500 mouse anti-α-smooth muscle actin (RRID: AB_262054) (Sigma-Aldrich, St. Louis, MO). After washes in PBS, tissues were incubated for 1 hr at RT with the appropriate secondary antibodies raised in donkey, conjugated with 488DyLight 1:800 (RRID: AB_2492289), 405DyLight 1:200 (RRID: AB_2340373) or Cy5 1:500 (RRID: AB_2340820) (Jackson Immunoresearch Laboratories). Sections were washed in PBS again before being mounted with Vectasheild (VectorLabs). Images were acquired using a Nikon A1R confocal microscope (Nikon Instruments), with minimal background staining observed in the control reactions where primary antibodies were omitted or P2 receptor antibodies were pre-absorbed with control antigen prior to exposure to tissues. For confocal photomicrographs, two-dimensional flattened images of the projected z-stacks are presented. Animal use was in accordance with guidelines approved by the University of São Paulo Animal Care and Use Committee. A total of 21 adult male Wistar rats (60–90 days of age; 270–310 g) were used for in vivo experiments. General anesthesia was induced with 5% halothane in 100% O2. A tracheostomy was made and the halothane concentration was reduced to 1.4–1.5% until the end of surgery. The femoral artery was cannulated (polyethylene tubing, 0.6 mm o.d., 0.3 mm i.d., Scientific Commodities) for measurement of arterial pressure (AP). The femoral vein was cannulated for administration of fluids and drugs. Rats were placed supine onto a stereotaxic apparatus (Type 1760; Harvard Apparatus) on a heating pad and core body temperature was maintained at a minimum of 36.5°C via a thermocouple. The trachea was cannulated. Respiratory flow was monitored via a flow head connected to a transducer (GM Instruments) and CO2 via a capnograph (CWE, Inc,) connected to the tracheal tube. Paired EMG wire electrodes (AM-System) were inserted into the diaphragm muscle to record respiratory-related activity. After the anterior neck muscles were removed, a basio-occipital craniotomy exposed the ventral medullary surface, and the dura was resected. After bilateral vagotomy, the exposed tissue around the neck and the mylohyoid muscle was covered with mineral oil to prevent drying. Baseline parameters were allowed to stabilize for 30 min prior to recording. Mean arterial pressure (MAP), diaphragm muscle activity (DiaEMG) and end-expiratory CO2 (etCO2) were digitized with a micro1401 (Cambridge Electronic Design), stored on a computer, and processed off-line with version 6 of Spike 2 software (Cambridge Electronic Design). Integrated diaphragm activity (∫DiaEMG) was collected after rectifying and smoothing (τ = 0.03) the original signal, which was acquired with a 300–3000 Hz bandpass filter. Noise was subtracted from the recordings prior to performing any calculations of evoked changes in DiaEMG. A direct physiological comparison of the absolute level of DiaEMG activity across nerves is not possible because of non-physiological factors (e.g., muscle electrode contact, size of muscle bundle) and the ambiguity in interpreting how a given increase in voltage in one EMG relates to an increase in voltage in another EMG. Thus, muscle activity was defined according to its baseline physiological state, just prior to their activation. The baseline activity was normalized to 100%, and the percent change was used to compare the magnitude of increases or decreases across muscle from those physiological baselines. Each in vivo experiment began by testing responses to hypercapnia by adding pure CO2 to the breathing air supplied by artificial ventilation. In each rat, the addition of CO2 was monitored to reach a maximum end-expiratory CO2 between 9.5% and 10%, which corresponds with an estimated arterial pH of 7.2 based on the following equation: pHa = 7.955–0.7215 × log10 (ETCO2) (Guyenet et al., 2005). This maximum end-expiratory CO2 was maintained for 5 min and then replaced by 100% O2. To determine whether local regulation of vascular tone in the region of the RTN contributes to the CO2/H+-dependent drive to breathe, we made bilateral injections of saline, phenylephrine (Phe, 1 µM), U46619 (1 µM) or sodium nitroprusside (SNP, 1 µM) while monitoring DiaEMG amplitude and frequency. These drugs were diluted to 1 µM with sterile saline (pH 7.4) and applied using single-barrel glass pipettes (tip diameter of 25 µm) connected to a pressure injector (Picospritzer III, Parker Hannifin Corp, Cleveland, OH). For each injection, we delivered a volume of 100 nl over a period of 5s. Injections in the VMS region were placed 1.9 mm lateral from the basilar artery, 0.9 mm rostral from the most rostral hypoglossal nerve rootlet, and at the VMS. The second injection was made 1–2 min later at the same level on the contralateral side. In separate series of experiments saline, ATP (1 mM), UTPγS (1 mM) or PPADS (10 µM) were applied similarly to the VMS to test the effect of P2-blockade on vascular CO2/H+ reactivity and the ventilatory response to CO2. A cranial optical window was prepared using standard protocols previously described (Kim et al., 2015). Briefly, a dental drill (Midwest Stylus Mini 540S, Dentsply International) was used to thin a circumference of a 4–5 mm-diameter circular region of the skull over somatosensory cortex (stereotaxic coordinates: AP: −1.8 mm from bregma and ML: 2.8 mm lateral to the midline). For the VMS, the anterior neck muscles were removed, a basio-occipital craniotomy exposed the ventral medullary surface, and the dura was resected. Pial vessels in the VMS had an average and were located 1.9 mm lateral from the basilar artery and 0.9 mm rostral to the most rostral portion of the hypoglossal nerve rootlet. Both thinned bone were lifted with forceps. The surface of the cortex or the VMS were cleaned with buffer containing (in mmol/L) the following: 135 NaCl, 5.4 KCl, 1 MgCl2, 1.8 CaCl2, and 5 HEPES, pH 7.3., and a chamber (home-made 1.1-cm-diameter plastic ring was glued with dental acrylic cement attached to a baseplate). The chamber was sealed with a circular glass coverslip (#1943–00005, Bellco). The baseplate was affixed to the Digital Camera (Sony, DCR-DVD3-5) and a light microscope was used for vessel imaging (x40 magnification). Vessel diameter was determined offline using ImageJ. For in vitro experiments, stack registration and selection of linear regions of interest (ROIs) (three regions per arteriole) was carried out. Linear ROI’s were used to create a fluorescent intensity profile plot as described previously (Mishra et al., 2014) and a macro (available at https://github.com/omsai/blood-vessel-diameter [Nanda, 2017]; copy archived at https://github.com/elifesciences-publications/blood-vessel-diameter).was used to determine the peak-peak distance as a measure of vessel diameter for each frame. In most cases, we also confirmed vessel diameter by manually measuring at least one point per frame. In vivo data was also analyzed using three linear ROI’s drawn perpendicular to the vessel in each image and the Diameter plug-in function in ImageJ was used to calculate changes in diameter (Kim et al., 2015; Fischer et al., 2010). All in vitro images were calibrated and pixel distances converted to diameter (µM) and these values were used for analysis of CO2/H+ or agonist-induced changes in vessel diameter from baseline by RM-one-way ANOVA and Fishers LSD test or paired t-test. Hash marks were used to identity differences from baseline (vasoconstriction or vasodilation). Mean percent changes in vessel diameter was used to compare between agonist responses or CO2/H+ responses under control conditions vs during purinergic receptor blockade or in the presence of an ectonucleotidase inhibitor by one-way ANOVA and Fishers LSD test or t-test. Asterisks were used to identify differences in % change in vessel diameter. For in vivo experiments, respiratory muscle activity was calculated as the mean amplitude of the integrated DiaEMG over 20 respiratory cycles. To obtain control values, the 20 cycles preceding each experimental manipulation for all parameters were averaged. Under hypercapnic conditions, measurements from the 20 cycles preceding stimulus cessation were averaged. Respiratory frequency (fR) was (1/(inspiratory time + expiratory time). Differences in the ventilatory response to CO2 were determined using either paired t-test or one-way analysis of variance (ANOVA) followed by the Bonferroni multiple-comparisons as appropriate. Power analysis was used to determine sample size, all data sets were tested for normality using Shapiro-Wilk test. All data values are expressed as means ± SEM and specific statistical test and relevant p values are reported in the text and figure legends. American Journal of Physiology. Regulatory, Integrative and Comparative Physiology 296:R1473–R1495. Is there a basis for distinguishing two types of P2-purinoceptor? General Pharmacology: The Vascular System 16:433–440. Journal of Applied Physiology: Respiratory, Environmental and Exercise Physiology 47:104–115. The European Journal of Neuroscience 34:250–262. AJP: Regulatory, Integrative and Comparative Physiology 298:R1648–R1658. The Journal of Physiology 592:491–504. British Journal of Pharmacology 117:203–209. Respiratory Physiology & Neurobiology 142:27–42. Cold Spring Harbor Perspectives in Biology 7:a020388. Journal of Applied Physiology 90:1887–1899. The Journal of Physiology 11:85–158. The Journal of Physiology 592:1309–1323. The Journal of Physiology 590:2137–2150. Journal of Applied Physiology 106:850–856. The Journal of Physiology 577:319–329. Prostaglandins, Leukotrienes and Essential Fatty Acids 69:437–448. Thank you for submitting your work entitled "Purinergic signaling provides specialized control of vascular tone to support the drive to breathe" for consideration by eLife. Your article has been favorably evaluated by a Senior Editor) and three reviewers, one of whom, Jan-Marino Ramirez (Reviewer #1), is a member of our Board of Reviewing Editors. The reviewers saw the importance of your significance, but felt that the pharmacology was not sufficiently convincing to support your conclusions. They suggest testing your hypothesis with additional drugs that are more specific. The study by Hawkins and collaborators demonstrates that the effect of CO2/H+ on the vascular tone in the RTN, the presumed site for central chemoreception, is significantly different from the vascular control in the cortex. A) It is the first demonstration that CO2 does not cause a uniform vasodilation throughout the nervous system, but that it differentially controls an area that senses CO2. B) The study is also interesting as it links chemosensation to concurrent changes in vascular tone. This is an interesting and novel concept that will trigger further studies aimed at better defining this interaction. In this study, the role of purinergic modulation of vascular tone is primarily explored by pharmacological manipulations, as is the in vivo demonstration. The use of phenylephrine for example will affect vascular tone, but this manipulation might also have other indirect effects. Given the novelty of this observation, I am not too concerned that most mechanistic insights are based on pharmacological manipulations. However, being primarily a pharmacological study the authors cannot definitely demonstrate e.g. that it is the asctrocytic ATP which antagonizes the CO2/H+ vasodilation. 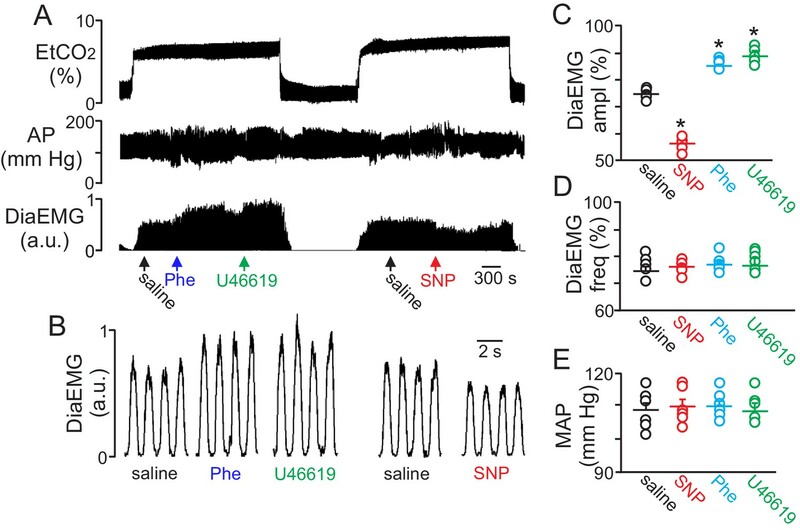 This is a potentially interesting paper that makes the case that ATP signaling mediates a specialized form of signaling in the brain areas that control breathing. Overall, I found this finding to be a useful contribution, but was not convinced that it was sufficiently novel for a general audience. In some ways, it seems appropriate for a specialized audience of researchers working on breathing. My major concern for the paper is the use of 100 μm suramin and PPADS to implicate purinergic signaling. At these concentrations, neither drug is specific and their ability to block many other receptors is well described in published work. Moreover, much better blockers are available that target distinct ATP receptors. My suggestion is to repeat the key experiments with more selective antagonists and/or to repeat the experiments with suramin and PPADS at 3-10 uM, at which doses they are considered more selective for ATP receptors over receptors for other neurotransmitters. Without a more complete evaluation of ATP's involvement, the central message of this paper appears to be on weak foundations. Finally, some of the traces in Figure 1 showing changes in blood vessel diameter over time were not particularly clear or convincing (e.g. Figure 1D1, A2, E2). Perhaps bolster these experiments with another in vitro approach to be sure the metrics used are reliable. This is manuscript begins to address the intriguing idea that vascular tone in the chemosensitive area, the retrotrapezoid nucleus (RTN) responds differently to increasing CO2/H+, and thus, likely contributing to the chemosensitivity response. The authors used both in vitro and in vivo preparations to examine changes in arteriole diameter on the ventrolateral medullary surface during increased CO2/H+ and after blocking purinergic receptors with suramin or PPADS. Cumulatively, the authors suggest that their results demonstrate that the arterioles near the RTN respond to ATP released from astrocytes to prevent vasodilation in response to increasing CO2/H+. This is a very interesting and important idea; however, two major issues fail to be addressed in this manuscript. Firstly, the authors also fail to address why different purinergic receptor antagonists are used in the in vitro (suramin) and in vivo (PPADS) experiments. Secondly, the authors fail to acknowledge that suramin, and to a lesser extent PPADS, are associated with non-specific effects, particularly at glutamate receptors in the concentrations used here (for example, see Gu et al., 1998, Neuroscience Letters; Motin and Bennett, 1995, Br. J. Pharmacol. ; Nakazawa et al., 1995, Naunyn Schmiedebergs Arch. Pharmacol; Lambrecht, 2000, Naunyn Schmiedebergs Arch. Pharmacol). These two issues at a minimum need to be addressed in the Discussion. In addition, the authors need to address how these non-specific actions could alter their conclusions. Lastly, the authors state clearly in the Introduction that they hypothesize "CO2/H+-evoked astrocyte ATP release will antagonize CO2/H+-vasodilation in the RTN…"; however, this is not actually the hypothesis that the authors test since they do not directly test the involvement of astrocytes. While this is a logical conclusion based on previous work and in conjunction with the studies tested here, the hypothesis stated needs to accurately describe the experiments herein. In other words, the hypothesis tested is that ATP released during increased CO2/H+ does not cause vasodilation in the RTN. Despite these issues, the data presented is very interesting and has the potential to foster additional studies to examine the interaction between astrocytes and the vasculature in this area, similar to work in the cortex. Thank you for submitting your work entitled "Purinergic signaling provides specialized control of vascular tone to support the drive to breathe" for consideration by eLife. Your article has been favorably evaluated by a Senior Editor and three reviewers, one of whom, Jan-Marino Ramirez (Reviewer #1), is a member of our Board of Reviewing Editors. The reviewers continue to believe that the study is potentially of general interest, and that your finding is significant. But, the reviewers felt that the authors continue to overstate their findings as detailed in the reviews. Most importantly, the reviewers remain unconvinced that the study demonstrates the purinergic modulation. The study still reports experiments in which the drugs are used at concentrations that are non-specific. Moreover, it is not always clear what concentrations were used. One reviewer suggests additional experiments with P2X and P2Y receptor agonists and antagonists that would more specifically test the proposed mechanism. As also suggested, the addition of immunohistochemistry would clearly strengthen the study by demonstrating that there is indeed the expression of the relevant receptors. Inhibitors of ectoATPases could be tried to explore endogenous ATP involvement, and apyrase could be used to degrade ATP. Although, one reviewer suggested the use of knock-out mice, there was not consensus that this is really necessary for the main conclusion. This revised manuscript has greatly improved and the authors provide various convincing arguments why this study is interesting for a general readership. I agree with the authors that the local control of vascular tone has general implication and is not only relevant for those interested in respiration. Moreover, the authors have been very responsive and added various new experiments that strengthen their conclusions. The authors used for example an additional vasoconstrictor that has been frequently used, thus addressing a previous concern, and strengthening the conclusion that the RTN is involved in regulating vascular tone. The use of PPADS was suggested by the reviewers and the authors added new experiments to strengthen their pharmacological characterization of purinergic signaling, which is consistent with the findings obtained with the exogenous application of ATP. Another strength is the combination of in vitro and in vivo approaches. The authors added new figures and re-arranged figures to enhance the clarity of the manuscript. Thus, the authors have addressed all my previous concerns. The manuscript by Hawkins et al. is vastly improved by the revisions. The authors addressed the concerns brought forth by the reviewers. And this reviewer remains interested in the results; however, a few lingering issues remain that decrease the clarity of the manuscript. Mainly, some of the results of the current experiments continue to be overstated (see below). As discussed in the previous review, while these conclusions are plausible given previously published results, the results from the present experiments do not directly lead to such conclusions. Wording adjustments are necessary to make clear what is actually shown in the current paper. Secondly, inconsistencies between the data reported in the text of the results and the figures (specifically the bar graphs) is concerning (see below for details). These discrepancies make it challenging to accurately evaluate the manuscript. Overall, this manuscript remains of interest to this reviewer with a few more revisions. "Together, these results suggest that astrocytes and purinergic signaling have fundamentally different roles in the regulation of vascular tone in the RTN and cortex, with the RTN being specialized to support chemoreceptor function." The reviewer would agree with the conclusion about purinergic signaling, but these data do not directly address involvement of astrocytes. The authors measure arterioles, not astrocyte activity. "These results provide clear evidence that increasing or decreasing vascular tone in the RTN will influence the response to CO2. Therefore, we conclude that regulation of vascular tone in the RTN contributes to the chemoreflex." The conclusion for these results is more appropriately worded in the response to reviewers. Since the authors did not verify vascular tone in the experiments related to this conclusion, this conclusion is overstated for what is shown. Despite the addition of the U46619 data, the data does not indicate these drugs ONLY altered blood vessels. Based on the data presented, they cannot rule out diffusion of the drugs and altering astrocytes or neurons in VLM. Figure 1 and Results. Overall, it is unclear which statistical tests were run and which data were involved in which tests. The Methods indicate both t-tests and ANOVAs were run, but it is not clear when each was run or how data were grouped to determine significance. 3) It is unclear what "control" is for Figure 1. Is control the response to CO2 for all data in Figure 1? In specific, is "con" referring to the CO2 response or the t-ACPD in Figure 1E1? The same question for Figure 1F2. If in both cases, "con" refers to the CO2 response and if that is included when running the statistics, why does this bar not appear in the summary data? 4) Figure 1F1. – Data in text indicate constriction of 3.6 +/- 1.3%, but average bar appears at -5% for t-ACPD. Additionally, figure legend indicates p<0.05, but p-value reported in the text is p=0.05. 5) Figure 1G1. – What is the ATP data compared to? A 0% baseline, CO2 response or t-ACPD? Additionally, the p-value in the text is denoted as p=0.0018, but is labeled as P<0.001 in the figure legend. 6) Figure 2 and Results. Given how the results are presented in the text (as changes from saline), it is unclear what numbers were used to run the statistics (%ampl or the δ numbers)? If run on the δ numbers, a justification is needed. 7) Based on the% ampl numbers presented in Figure 2C-E, the data are convincing, but the necessity of presenting the numbers differently in the results remains unclear. 8) Why is there only one p-value reported for Figure 2C? 9) Response to reviewers indicated additional data had been added to Figure 2B-D, but the U46619 data is not shown in 2B. 10) Figure 3 and Results. Again, the scale for the bar graphs in Figure 3A and C do not match the numbers presented in the results. 11) The corresponding frequency and amplitude% data are not reported in the text of the results. The authors have performed some additional experiments to tackle the issue of non-specific effects of suramin and PPADS. However, the original concerns remain – the evidence to implicate a purinergic mechanism is based on non-specific pharmacology. I agree the data are suggestive of a purinergic mechanism, but as shown the data do not provide strong evidence to prove this. This weakness also challenges the impact of the observations and the study as a whole for eLife. 1) The authors have included the use of 10 μm PPADS in Figure 1 and 3. However, in Figure 1 they still report data with 100 μm suramin. This is perplexing as at this concentration the drug is non-specific. 2) In Figure 3 new data are added with 10 μm PPADS (Figure 3A), but the data in Figure 3D-F are still based on 100 μm PPADS, which is a non-specific concentration. In the last paragraph of the Results and Discussion, they state low concentrations of PPADS are specific, which suggests that they know 100 μm PPADS is non-specific. Why report data with its use at this concentration? Overall, the manuscript has improved, but the study still relies on high concentrations of drugs that are well known to be non-specific. Additional experiments with P2X and P2Y receptor agonists and antagonists need to be tried to really prove the mechanism that is proposed. Immunohistochemistry needs to be shown to demonstrate expression of the relevant receptors. Inhibitors of ectoATPases can be tried to explore endogenous ATP involvement. Apyrase could be used to degrade ATP. Ideally, key experiments could be tried in a knock-out mouse of the relevant receptor. In short, the central finding to implicate ATP is not convincing and more work is needed. The current level of proof (suramin, ATP and PPADS) is where the field was 20-30 years ago. Better tools, drugs and mouse models are available. They should be tried. Thank you for submitting your article "Purinergic regulation of vascular tone in the retrotrapezoid nucleus is specialized to support the drive to breathe" for consideration by eLife. Your article has been favorably evaluated by a Senior Editor and three reviewers, one of whom, Jan-Marino Ramirez (Reviewer #1), is a member of our Board of Reviewing Editors. The following individual involved in review of your submission has agreed to reveal their identity: Jerome Dempsey (Reviewer #3). We congratulate you to your discovery of a differential control of the vascular system within the RTN, the region critical for the sensing of CO2. It is well established that in response to increased CO2/H+ the brain, and body in general, responds with vasodilation, a physiological response necessary to increase blood flow and to facilitate oxygenation and removal of CO2/H+. Your study convincingly demonstrates that the arterioles in the RTN constrict in response to CO2/H+, which is mediated by purinergic receptors. The RTN is the presumed site for chemoreception and it seems advantageous that the RTN has a differential vasomotor response compared to other sites in the body, a response that seems to be adapted to allow optimal chemoreception. Whether the RTN is the only central nervous system site to differentially control the vasomotor response cannot be deduced from these experiments. But, the study supports the notion that the vascular response is differentially regulated to adapt the blood supply to the specific function of a given CNS region. We have a few discussion points listed under "Essential revisions" that we would like you to address to further improve the impact of your study. 1) We would like you to discuss other studies and observations that are potentially consistent with a local control of vascular reactivity within the brain. We believe that the following studies could be relevant for the concept that you propose in the present study. A) In healthy humans indomethacin administration reduces the CBF and "cerebrovascular" response to hyper-/hypocapnia in the middle cer artery and many other brain and brain stem regions (see Xie et al. 2006, 2009 ref and references) with corresponding increases in eupneic ventilation and the ventilatory response slope to hyperoxic hypercapnia and hypocapnia. B) Similar increases in the CO2 ventilatory response occurred with carotid occlusion in the goat (Parisi, 1992, Chapman, 1979). C) Clinically, in post-transplantation anaemia and associated congestive heart failure, cerebrovascular responses to CO2 have steep ventilatory responses to CO2 contributing to breathing instability and apneas. Could this (C) and the other findings (A, B) mean that under certain conditions that influence cerebral vascular reactivity "globally", there are marked influences on chemoreceptor responsiveness and ventilatory control stability, because they influence the PCO2 locally at the level of the chemoreceptors? Would these observations be compatible with a qualitatively different vascular responsiveness to CO2/H+ at the level of the central chemoreceptors as your data supports? A discussion like this could enhance the clinical impact of your interesting finding. 2) We would like you to discuss/clarify the following consideration: Your contention that the unique RTN vascular responsiveness to CO2/H+ "enhances chemo function","…contributes to the drive to breathe", "…supports neural function and behavior" seems to imply that you believe this specialized function to be beneficial to the organism. However the function of both the ventilatory response and (at least most of) the cerebral vascular response to hyper/hypocapnia is to minimize the disturbance in CO2/H+.….so would not having the vasodilation/vasoconstriction responses in the RTN mean that the burden is now completely on the (more expensive?) ventilatory response to regulate local H+? 3) It would help to include n values in the figures and/or figure legends. 4) The use of "con" and "control" is still confusing. The reviewer thanks the authors for clarifying "con" in the response to reviewers. It would help the readers of the manuscript to benefit from such clarification. This reviewer recommends labeling it as baseline, instead of "con" or "control". Particularly, since the CO2 group becomes the control group in comparisons. 5) Figure 1B. The figure legend describes that 1B shows the response in PPADs, but only "con" and CO2" are shown. 6) Results/Discussion, "under control conditions", "baseline" would be more informative. 7) Figure 3: Like for Figure 1, it would be more informative to refer to "baseline" and "CO2" rather than "control conditions". 8) Excellent work from Brian MacVicar's group has gone a long way to helping understand the role of astrocytes in cerebral blood flow, yet reference to this group is only made in the Methods section. Additional acknowledgement to their body of work is needed, including their most recent paper (see below). 9) Results/Discussion, first paragraph: N=34 – is this n=34 animals or 34 vessels? Please clarify. 10) Results/Discussion, second paragraph: Did the authors also do immuno for P2X receptors? Are they expressed there, but not involved? If the authors are eliminating their involvement, it would be useful to know whether or not they are expressed there. 11) Results/Discussion, fifth paragraph: MRS2179 data not shown in figures. Please indicate in the text. 12) Also, a reference to a recent study from MacVicar's group needs to indicate that more is known about dilation in the hippocampal-neocortical/barrel cortex (Howarth et al. 2017 J Neurosci). 13) It would be helpful for the authors to address why pharmacologically manipulating RTN vessels changes amplitude and not frequency in Figure 4, but changes both in Figure 5. 14) Figure 1: Figure 1B. The figure legend describes that 1B shows the response in PPADs, but only "con" and CO2" are shown. 15) Figure 2: Parts C and D are not addressed in the figure legend. 16) Figure 5: Saline should be open/white bars, not black bars. 17) Methods – your use of "peak" di EMG to quantify "resp muscle activity" is partly dependent on breath timing changes alone. Wouldn't a more appropriate metric be either mean amplitude (total area over TI) or rate of rise of di EMG? 18) You chose to test the "response to hypercapnia" in vivo by raising FetCO2 to 10% or almost twice the air br value in the rodent and showing that the vessel diam changed 3-4%. Given the highly sensitive response of CBF to CO2 in the cer vasc (3-4% per mmHg δ PCO2) did you try more physiologic perturbations to show the sensitivity of your prep? Also, given the absence of protein buffers in the cerebral ECF your pH in the RTN is probably in the 6-6.5 range with your level of hypercapnia. […] In this study, the role of purinergic modulation of vascular tone is primarily explored by pharmacological manipulations, as is the in vivo demonstration. The use of phenylephrine for example will affect vascular tone, but this manipulation might also have other indirect effects. Given the novelty of this observation, I am not too concerned that most mechanistic insights are based on pharmacological manipulations. However, being primarily a pharmacological study the authors cannot definitely demonstrate e.g. that it is the asctrocytic ATP which antagonizes the CO2/H+ vasodilation. We agree that our pharmacological evidence does not definitively identify astrocytes as the source of CO2/H+-evoked ATP. Considering that previous work has already shown that RTN astrocytes release ATP when activated by CO2/H+ or by optogenetic simulation (PMID: 20647426), we have modified the focus of this study to understand how CO2/H+-evoked ATP release contributes to respiratory drive by regulating local vascular tone. Specifically, we hypothesize that purinergic signaling provides specialized control of vascular tone by preventing CO2/H+-induced vasodilation within the RTN. We believe this is an important and broadly relevant focus since virtually nothing is known regarding regulation of vascular tone in any respiratory control center, and because it is not clear whether vascular control might be tailored to support specific neural functions. We also appreciate your concern that the vasoconstrictor used in vivo (phenylephrine) may have indirect effects. Therefore, we performed additional in vivo experiments using a second commonly used vasoconstrictor (U46619; a thromboxane A2 receptor agonist) (PMID: 15499024; PMID: 17013381). Consistent with our phenylephrine results, we found that application of U46619 to the RTN region increased the ventilatory response to CO2 but with no change in mean arterial pressure. These new results have been added to Figure 2B-D. We also used U46619 for our in vitro experiments and can confirm that this drug is a potent vasoconstrictor. Therefore, these results provide strong support for our hypothesis that regulation of vascular tone in the RTN is important functional for control of respiratory behavior. We thank the reviewer for their helpful suggestions. We respectfully disagree with the reviewer that the significance of our study is limited to the field of respiratory control. Our discovery that the vascular response to CO2/H+ in the RTN is opposite to the rest of the cerebrovascular tree is the first evidence to suggest that regulation of vascular tone in any brain region is tailored to support local neural network function and ultimately behavior. The behavior we focus on is breathing, however, the significance of this discovery may be relevant to a wide range of behaviors and so we believe this study will be broadly appealing to any interested in neurovascular control. We performed three new sets of experiments to support our conclusion that purinergic signaling prevents CO2/H+-induced dilation of RTN arterioles. First, as suggested by the reviewer we re- tested the effects of CO2/H+ on vascular tone in vitro and in vivo using low concentrations of PPADS. We found that 5 µM PPADS was sufficient to eliminate CO2/H+-induced vasoconstriction of RTN arterioles in vitro. These new data are illustrated in Figure 1C1. Likewise, in the whole animal we found that application of 10 µM PPADS onto the ventral surface converted CO2/H+ constriction into a significant dilation. Conversely, in the cortex increasing end expiratory CO2 resulted in vasodilation under control conditions and in the presence of low or high PPADS. These new results are shown in Figure 3A, C. These results are entirely consistent with our previous results using higher concentrations of P2 receptor blockers, thus further supporting our main conclusion that CO2/H+-evoked ATP release causes vasoconstriction RTN arterioles in vitro and in vivo. Second, we mimicked the effects of CO2/H+ by exogenous application of ATP. In both the slice and whole animal we found that ATP caused vasoconstriction of RTN vessels. These new results are shown in Figures 1G1 and 3A. Third, since RTN neurons are activated by CO2/H+ we re-tested the effects of high CO2/H+ on vascular tone in the presence of tetrodotoxin (TTX) to block neuronal action potentials. As expected, we found in vitro that CO2/H+-mediated vasoconstriction was retained in the presence of TTX. These results have been added to the text. Together, these results provide strong evidence for the possibility that CO2/H+-evoked ATP release (most likely from astrocytes) causes vasoconstriction of RTN arterioles, and in conjunction with our functional in vivo evidence showing that vasoconstriction and dilation of RTN vessels increases and decreases the ventilatory response to CO2, show that regulation of vascular tone in the RTN is an important determinant of respiratory behavior. We appreciate the reviewers point that the observed effects of CO2/H+ and t-ACPD on vessel diameter are modest. However, it is important to recognize that blood flow is dependent on the 4th power of radius; therefore, even small changes in vessel diameter could have profound effects on blood flow. In any case, to bolster our conclusion that purinergic signaling causes vasoconstriction, we confirmed that exogenous ATP also results in vasoconstriction both in vitro. We also recapitulated the effects of CO2, PPADS, and ATP on RTN vessels in vivo, thus giving us confidence that what we observed in the slice is real and of functional relevance to respiratory activity. This is manuscript begins to address the intriguing idea that vascular tone in the chemosensitive area, the retrotrapezoid nucleus (RTN) responds differently to increasing CO2/H+, and thus, likely contributing to the chemosensitivity response. The authors used both in vitro and in vivo preparations to examine changes in arteriole diameter on the ventrolateral medullary surface during increased CO2/H+ and after blocking purinergic receptors with suramin or PPADS. Cumulatively, the authors suggest that their results demonstrate that the arterioles near the RTN respond to ATP released from astrocytes to prevent vasodilation in response to increasing CO2/H+. This is a very interesting and important idea; however, two major issues fail to be addressed in this manuscript. Firstly, the authors also fail to address why different purinergic receptor antagonists are used in the in vitro (suramin) and in vivo (PPADS) experiments. We have remedied this issue by testing the effects of PPADS on vascular CO2/H+ reactivity in both preparations. We found that PPADS prevented CO2/H+-induced vasoconstriction in vitro and in vivo. Interestingly, in the whole animal RTN application of PPADS converted CO2/H+- induced vasoconstriction into a significant dilation. This response suggests that in the absence of purinergic signaling RTN vessels respond to CO2/H+ in a manner similar to the cortex. These new results are shown in Figures 1C1 and 3A-C and the text has been modified accordingly. Secondly, the authors fail to acknowledge that suramin, and to a lesser extent PPADS, are associated with non-specific effects, particularly at glutamate receptors in the concentrations used here (for example, see Gu et al., 1998, Neuroscience Letters; Motin and Bennett, 1995, Br. J. Pharmacol. ; Nakazawa et al., 1995, Naunyn Schmiedebergs Arch. Pharmacol; Lambrecht, 2000, Naunyn Schmiedebergs Arch. Pharmacol). These two issues at a minimum need to be addressed in the Discussion. In addition, the authors need to address how these non-specific actions could alter their conclusions. As noted above we addressed potential off-target effects of our pharmacological approach by performing several sets of experiments. First, we re-tested CO2/H+-vascular responses in the presence of PPADS at a concentration that reportedly is specific for P2 receptors (PMID: 15351302). We found that 5 µM PPADS blocked CO2/H+-mediated vasoconstriction of RTN in vitro and 10 µM PPADS blocked CO2/H+ vasoconstriction of RTN vessels in vivo. These new results have been added to Figures1C1 and 3A, C.
Third, to minimize a potential neuronal contribution we re-tested vascular responses to CO2/H+ in vitro in the presence of TTX to block action potentials. We found that CO2/H+-mediated vasoconstriction was retained in the presence of TTX. These results have been added to the text. Based on these findings we are confident that CO2/H+-evoked ATP release causes vasoconstriction of RTN arterioles in a manner that supports the drive to breathe. Nevertheless, we added a statement to the last paragraph of the discussion to acknowledge the limitation of our pharmacological approach. Lastly, the authors state clearly in the Introduction that they hypothesize "CO2/H+-evoked astrocyte ATP release will antagonize CO2/H+-vasodilation in the RTN…"; however, this is not actually the hypothesis that the authors test since they do not directly test the involvement of astrocytes. While this is a logical conclusion based on previous work and in conjunction with the studies tested here, the hypothesis stated needs to accurately describe the experiments herein. In other words, the hypothesis tested is that ATP released during increased CO2/H+ does not cause vasodilation in the RTN. Good point. 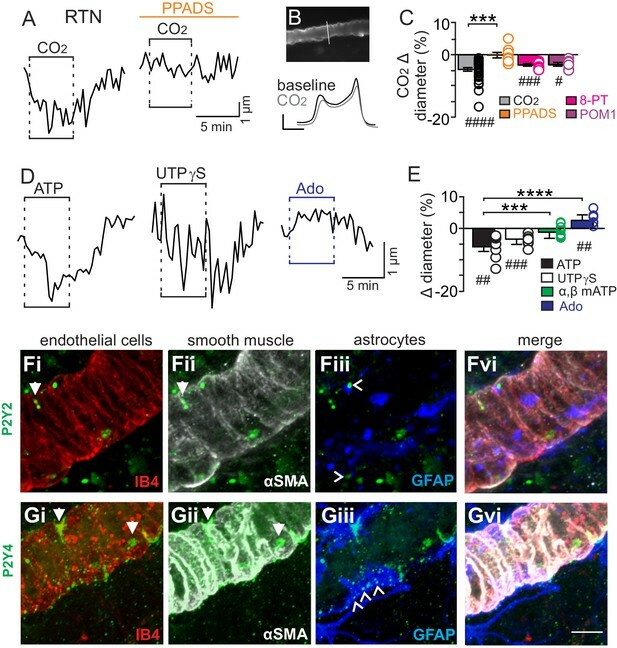 Since there is compelling evidence showing that RTN astrocytes release ATP when activated by CO2/H+ or optogenetic simulation (PMID: 20647426), we have modified the focus of this study to understand how CO2/H+-evoked ATP release contributes to respiratory drive by regulating local vascular tone. As suggested, our new hypothesis is that purinergic signaling provides specialized control of vascular tone by preventing CO2/H+-induced vasodilation within the RTN. As noted above, this is an important and broadly relevant focus since virtually nothing is known regarding regulation of vascular tone in any respiratory control center, and because it is not clear whether vascular control might be tailored to support specific neural functions. Despite these issues, the data presented is very interesting and has the potential to foster additional studies to examine the interaction between astrocytes and the vasculature in this area, similar to work in the cortex. We thank the reviewer for their helpful suggestions. Based on your suggestions we have toned-down our conclusions and made clear the limitations of our approach. We have also carefully edited the text and figures to ensure all results are presented in a clear and consistent manner. We appreciate the reviewers point but it should also be recognized that t-ACPD is pharmacological tool commonly used to activate astrocytes. We have modified the statement in question to read “These results are consistent with our hypothesis that purinergic signaling, possibly from CO2/H+-sensitive RTN astrocytes (Gourine et al., 2010), serves to maintain arteriole tone in the RTN during hypercapnia”. Good point. We have modified the end of that paragraph to read “These results are consistent with the possibility that regulation of vascular tone in the RTN can influence respiratory output. […] It remains to be determined whether U46619 or SNP also affect activity of neurons or astrocytes in the RTN”. CO2 data in Figure 1. In Figure 1B, the “con” trace shows vessel diameter before exposure to CO2 whereas the “CO2” trace shows vessel diameter during high CO2. However, the summary data shown in Figure 1C is plotted as CO2-induced change in vessel diameter so control represents the CO2 response in the absence of any blockers and the other bars represent CO2 responses in the presence of the specified blocker. To make this clearer we now label the control trace as CO2. To determine if CO2/H+ significantly affected baseline vascular tone under each experimental condition, we compared the CO2/H+-induced change in diameter (µm) from baseline alone and in the presence of each blocker by RM-one-way ANOVA and Fishers LSD test and differences were identified by hash marks. We also compared the differences in CO2/H+-induced% change under control conditions vs. in the presence of blockers by one-way ANOVA and Fishers LSD test and these differences were identified by asterisks. t-ACPD data in the new Figure 2. To simplify this figure we moved the t-ACPD for the RTN and cortex into a separate new Figure 2. Again the “con” traces in Figures 2B and D show vessel diameter before exposure to t-ACPD whereas the “t-ACPD” trace shows vessel diameter during exposure to t-ACPD. The summary data shown in Figure 2E is plotted as t-ACPD induced change in vessel diameter and we now label the control trace as t-ACPD. % change under control conditions vs in PPADS by paired t-test. 4) Figure 1F1. Data in text indicate constriction of 3.6 +/- 1.3%, but average bar appears at -5% for t-ACPD. Additionally, figure legend indicates p<0.05, but p-value reported in the text is p=0.05. We have edited the text to make sure all results are consistent with figures. Note that absolute p values are reported in the text; however, to simplify figures we illustrate significance according to the following: one symbol = p < 0.05, two symbols = p < 0.01, three symbols = p < 0.001, four symbols = p < 0.0001. 5) Figure 1G1. What is the ATP data compared to? A 0% baseline, CO2 response or t-ACPD? Additionally, the p-value in the text is denoted as p=0.0018, but is labeled as P<0.001 in the figure legend. We compared the effects of ATP or other agonists on basal vessel diameter (µm) by RM-one- way ANOVA and Fishers LSD test and differences were identified by hash marks. We also compared ATP-induced% change in diameter to the% change elicited by more specific agonists and these differences were identified by asterisks. We have edited the text and figures to make sure they are consistent. We used the percent change from saline to calculate the statistics. Sorry for the confusion. We have modified how the data is presented in the text to match each figure. In this case, the effects of SNP, Phe and U46619 on DiaEMG are presented as percent change from saline; however, since these treatments had no effect on MAP those results are presented as absolute values in mm Hg. These data were analyzed using a one-way ANOVA followed by a Bonferroni multiple- comparison test, therefore only one P values is needed. We have added all relevant p values and specified each statistical test to make clear how the data was analyzed. We have modified this figure (new Figure 4) to include Phe, SNP and U46619. We have corrected text to make sure all numbers are consistent with figures. In the present version of the manuscript we incorporated the% values as suggested by the reviewer. Based on your suggestions, we have performed several additional experiments to support our conclusion that purinergic signaling contributes to regulation of vascular tone in the RTN during exposure to high CO2. In short, we i) repeated all key experiments using a lower and more specific concentration of PPADS; ii) performed additional experiments in vitro and in vivo using selective agonists that target P2X or P2Y2 and P2Y4 receptors; iii) confirmed by immunohistochemistry that candidate P2 receptors responsible for CO2/H+-induced vasoconstriction of RTN arterioles (P2Y2 and P2Y4) by expressed by appropriate cells in the region; and iv) performed additional in vitro experiments using an adenosine receptor blocker or an inhibitor of ectoATPase activity to determine if ATP breakdown products contribute to CO2/H+-sensitivity of RTN arterioles. We hope you agree that these new results provide compelling support of our hypothesis. We have repeated all suramin experiments with a low concentration of PPADS (5 µM) and can confirm that even at this concentration we were able to largely eliminate the response of RTN arterioles to CO2/H+ and t-ACPD. We know only show data using low (10 µM) PPADS. Again, this low concentration of PPADS effectively blocked the response of RTN pial vessels to CO2/H+. These new data should mitigate any concern regarding the use of high concentrations of drug that are known to be non-specific. Good suggestions. Low concentrations of PPADS is most effective at blocking P2X, P2Y2 and P2Y4 receptors (PMID: 9755289), and since low concentrations of PPADS (5 µM) blocked purinergic modulation of cortical and RTN vessels, we consider P2X and P2Y2 and P2Y4 candidate receptors for purinergic modulation of vascular tone in these regions. Therefore, we tested effects of a selective P2Y2 and P2Y4 receptor agonist (UTPγS) and an agonist with high affinity for P2X receptors (α,β-mATP) on diameter of arterioles in the RTN and cortex. In the RTN, we found that UTPγS but not α,β-mATP mimicked the vascular response to CO2/H+, thus suggesting P2Y2 and/or P2Y4 contribute to this response. We also confirmed by immunohistochemistry that P2Y2 and P2Y4 receptors are expressed by endothelial cells, smooth muscle cells and astrocytes associated with RTN arterioles. Therefore, we consider purinergic signaling, possibly through P2Y2 and/or P2Y4 receptors, as important. In the cortex, PPADS blunted CO2/H+-induced vasodilation in vitro and in vivo, suggesting endogenous purinergic signaling promotes vasodilation in this region. However, exogenous application of ATP or UTPγS both resulted in vasoconstriction in vivo. We also detected P2Y2 and P2Y4 immunolabeling of cells (endothelial cells, smooth muscle and astrocytes) associated with cortical arterioles. Therefore, we suspect these receptors are not targeted by endogenous purinergic signaling during high CO2, but when activated by exogenous agonists can influence vascular tone. Since we are primarily interested in understanding the role of purinergic signaling in the RTN so we did not further explore the basis of purinergic dilation in the cortex. As suggested, we also tested for involvement of adenosine signaling in the RTN by bath application of adenosine, the adenosine receptor blocker (8-phenyltheophylline; 8-PT) and by inhibiting ectonucleotidase activity with sodium metatungstate (POM 1). Although adenosine caused a significant vasodilation of RTN arterioles in vitro; neither 8-PT nor POM1 significantly affected CO2/H+-induced vasoconstriction, suggesting that purinergic metabolites do not limit purinergic induced vasoconstriction of RTN arterioles. We hope you agree that the additional results provide convincing support for a role of purinergic signaling in regulation of vascular tone in the RTN. This pharmacological work is essential for informing future targeted transgenic studies in a different species (mouse), however, we believe our results to be highly significant in their own right and worthy of publication in eLife. C) Clinically, in post-tranplantation anaemia and associated congestive heart failure, cerebrovascular responses to CO2 have steep ventilatory responses to CO2 contributing to breathing instability and apneas. We believe it is possible, indeed likely, that global manipulations of CO2/H+ vascular reactivity (point A) and/or cerebral blood flow (points A-B) which have been shown to influence basal breathing and the ventilatory response to CO2 could involve the RTN. Recent evidence showed in the hippocampus and cortex that CO2/H+ increases vascular tone by a cyclooxygenase (COX)-dependent mechanism (PMID: 28137973). This mechanism may also influence vascular tone in the RTN by limiting purinergic-mediated vasoconstriction. For example, we show in vivo that when purinergic receptors in the RTN are blocked, subsequent exposure to CO2/H+ results in vasodilation (Figure 5A), possibly by a COX-dependent mechanism. Therefore, systemic administration of indomethacin (a COX inhibitor) may increase baseline breathing and the ventilatory response to CO2 by potentiating CO2/H+/purinergic-dependent vasoconstriction of RTN arterioles. Alternatively, it is also possible that decreasing cerebral blood flow globally (indomethacin or occlusion) will cause widespread tissue and arteriole acidification that may be sufficient to recruit other putative chemoreceptor regions (e.g., NTS or raphe) to further increase chemoreceptor drive to the point where breathing may become unstable (point C). We agree that at the global level, CO2/H+-induced vasodilation and increased breathing help maintain stable tissue CO2/H+ levels within a narrow range that is suitable for life. However, buffering tissue CO2/H+ by this mechanism at the level of respiratory chemoreceptors may dampen chemoreceptor drive, thus diminishing the contribution of breathing to CO2/H+ homeostasis. Perhaps a more economical means of maintaining global CO2/H+ would be to coordinate vascular and respiratory responses while at the same time buffering global tissue CO2/H+. Consistent with this, the early work by Millhorn et al., 1984 and colleagues showed by measuring pH in the bulk CSF and at the ventral medullary surface in cats that acute changes in arterial CO2 caused rapid changes in pH at the medullary surface but slow and smaller responses in the bulk CSF (PMID: 6427871), thus suggesting tissue pH in the region of the RTN is less efficiently pH buffered possibly because CO2/H+ does not dilate vessels in this region. Our measures of vascular diameter in vitro (Figures 1, 3) and in vivo (Figure 5) confirm this possibility by showing that CO2/H+ causes vasoconstriction in the RTN but dilation in the cortex. These results suggest that tissue CO2/H+ levels near the RTN are less buffered by vascular CO2/H+ reactivity, possibly as a means of supporting the function role of this region in respiratory chemoreception. To avoid making the figures overly busy, we have added N values to all figure legends. Note that all N and p values are also reported in the text. Good point. We have redefined our control as baseline in the text and legends for Figures 1-3. In the legend of Figures 4–5 we define saline injection as control rather than baseline. We have reworded the figure legend to better describe each panel of the figure. We have made this change for Figures 1–3. We agree that Dr. MacVicar’s group has made substantial contributions to understanding the roles of astrocytes in control of cerebral blood flow. Indeed, we have modified our in vitro approach to use a more physiological O2 level based on their evidence that astrocyte control of vascular tone is strongly influenced by oxidative stress (PMID: 18971930). We have also added two additional references to this group’s work (PMID: 25818565; PMID: 28137973), and we have discussed how our results might fit with their recent evidence showing that astrocytes mediate CO2/H+ vascular responses by releasing prostaglandin E2 (PMID: 28137973). For example, when discussing the role of purinergic signaling in CO2/H+ dilation of cortical arterioles we added the following “Alternatively, arachidonic acid metabolites are also potent regulators of vascular tone (MacVicar and Newman, 2015) and recent evidence showed that CO2/H+-mediated vasodilation in the cortex and hippocampus involved activation of cyclooxygenase-1 and prostaglandin E2 release by astrocytes (Howarth et al., 2017). […] However, currently the cellular and molecular basis of purinergic dilation in the cortex remains unknown”. Also, as noted above, we discuss how disruption of COX1/PgE2 in the RTN might contribute to ventilatory responses to systemic administration of indomethacin. Please see our response to concern 1A-C.
We have clarified this by specifying vessel or animal with each n value. We have also specified in the Methods section the total number of animals used for in vitro and in vivo experiments. Our pharmacological evidence identified P2Y2/4 receptors and the substrates responsible for CO2/H+-dependent purinergic regulation of RTN arterioles. Therefore, we focused our immunohistochemical experiments only on confirming expression of P2Y2 and P2Y4 receptors near RTN and cortical arterioles. Nevertheless, it remains possible that P2X receptors are expressed in the regions of interest and so we do not exclude the possibility that P2X receptors may contribute to some aspect of vascular control in these regions. In the Results and Discussion we state that “It is also possible that other purinergic receptors contribute to regulation of arteriole tone in these regions”. We agree. We refer the reviewer to our answer to concern (8) above. In short, we have discussed our results in conjunction with the recent study by Howarth et al., 2017. To clarify this point, we added the following “Considering that manipulations of vascular tone preferentially affect respiratory amplitude (Figure 4A-D), whereas application of PPADS, which likely disrupts both direct excitatory effects of ATP on RTN neurons (Wenker et al., 2012) as well as indirect effects of ATP on vascular tone (Figure 5A), blunts respiratory frequency and amplitude, suggest that purinergic signaling in the RTN might regulate discrete aspects of respiratory output”. As noted in concern (5), we have reworded the figure legend to better describe each panel of the figure. We have modified the legend of Figure 2 to state “(C) diameter trace of a cortical arteriole and corresponding vessel image with example profile plots (D) show that exposure to tACPD (50 µM) increase cortical arteriole diameter”. Sorry for the mistake. In fact our analysis of DiaEMG amplitude was on mean amplitude over time (20 breathing cycles). We have corrected in the data analysis and statistics section to read "Respiratory muscle activity was calculated as the mean amplitude of the integrated DiaEMG over 20 respiratory cycles". For this initial characterization we chose a CO2 stimulus that is well characterized and thus will facilitate comparisons with previous work. However, now that we have established a foundation for comparison, in future work we plan to characterize vascular responses to CO2 over a range of stimuli. We thank David Attwell and Anusha Mishra (University College London), Catherine Hall (University of Sussex) and Pariksheet Nanda (University of Connecticut) for assistance with vessel image analysis. This work was supported by funds from the National Institutes of Health Grants HL104101 (DKM), HL126381 (VEH), and P01-HL-095488, R01-HL-121706, R37-DK-053832 and R01-HL-131181 (MTN). Additional support comes from the Totman Medical Research Trust (MTN), Fondation Leducq (MTN), EC Horizon 2020 (MTN), Connecticut Department of Public Health Grant 150263 (DKM), and public funding from the São Paulo Research Foundation (FAPESP) Grants 2014/22406-1 (ACT), 2016/22069–0 (TSM), 2015/23376–1 (TSM) and FAPESP fellowship 2014/07698-6 (MRML); Conselho Nacional de Desenvolvimento Científico e Tecnológico (CNPq); grant: 471263/2013–3 (ACT) and 471283/2012–6 (TSM). CNPq fellowship 301651/2013–2 (ACT) and 301904/2015–4 (TSM). Animal experimentation: All in vitro procedures were performed in accordance with National Institutes of Health and University of Connecticut Animal Care and Use Guidelines (protocol # A16-034). All in vivo procedures were performed in accordance with guidelines approved by the University of São Paulo Animal Care and Use Committee (protocol # 112/2015). © 2017, Hawkins et al. The response of the brainstem to increased levels of carbon dioxide in the blood is coordinated with the response of the cardiovascular system.